Both sides had pretty high-profile absentees through injury. PSG were still without Verratti and Pastore while City were missing Kompany, Toure and Sterling. The line-ups. 4-3-3 for PSG and 4-2-3-1 for City. It was no surprise that PSG dominated possession, having 65% of the ball during the match. 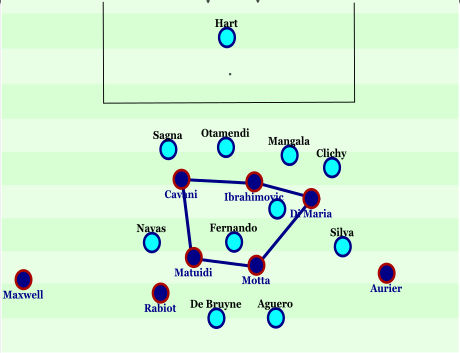 In possession Thiago Motta had an instrumental role, dropping playing between the centre-backs and aiming to play through the centre of the pitch. PSG’s front three were usually quite narrow in the centre and halfspaces while the full-backs kept PSG’s width. PSG’s front three were roaming and interchanging, looking to receive the ball in between City’s defensive and midfield lines. Ibrahimovic played what was almost a false-9 role, dropping deep to link up possession in front of City’s midfield line as well dropping just behind City’s midfield line, looking to receive passes through the centre from Motta. This 3v2 central overload was absolutely essential in PSG’s possession game, and allowed them to penetrate City’s midfield line centrally. Fernando and Fernandinho are marking PSG’s centre-midfielders however Ibrahimovic has dropped deep, allowing Motta to find a pass straight through them and into the space in between the lines. Above is an example of PSG’s central dominance in midfield. Ibrahimovic played a more involved role in possession than he usually does. He moved into the halfspaces and flank to create overloads, while also creating 2v1s on Fernando with Matuidi, allowing the frenchman to run into the space in between the lines with the ball at his feet. Ibrahimovic’s deeper base position meant that PSG had a 3v2 overload with Luiz, Silva and Motta vs De Bruyne and Aguero on the first line, and then Matuidi, Rabiot and Ibrahimovic vs Fernando and Fernandinho on the second line. 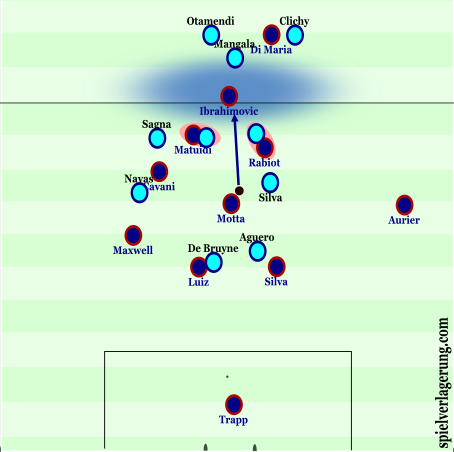 PSGs positionally fluid and interchanging front three did cause Manchester City’s man-orientated back four lots of problems, and I’ll go into greater detail later about how calamitous they were at times. They didn’t know whether to follow the players’ lateral and vertical movements and couldn’t deal with third-man runs. The above video shows how PSG’s rotation ripped apart City’s central midfield. The fact De Bruyne stayed advanced in City’s 4-4-2 meant that Fernandinho and Fernando were overrun and huge gaps were left in the centre of City’s midfield. Despite their dominance in possession, PSG weren’t overly productive in creating chances from their organised possession phase. One problem they had is that the overloads I’ve talked about on the first and second lines of City’s press, but then had nobody on the last line looking to make runs in behind the City defence. When Ibrahimovic found himself turning with the ball in between the lines, Cavani was too wide or not stretching City’s last line. This often meant they were forced to play put to their fullbacks in the final third. Also, their intelligence on the ball was lacking at times, particularly from David Luiz, meant that they weren’t as effective at getting the ball into dangerous zones. They too often played to the feet of their fullbacks on the flank, a pass that really isn’t ideal unless followed by a quick pass from the fullback into feet in the centre. 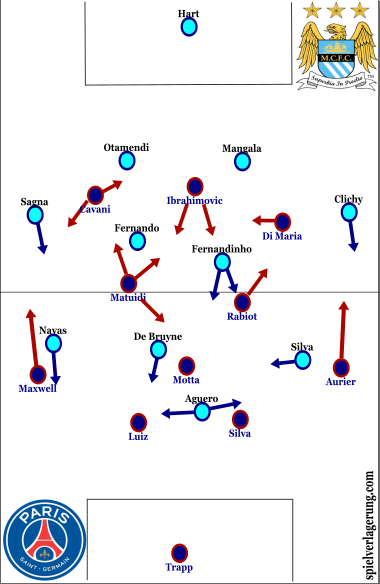 In attack, Manchester City were extremely narrow due to David Silva moving into central areas from his left-midfield position, this meant that they had little space to play in and were forced to move the ball quickly and use individualism to try to go droit au but (‘straight to goal’). This is pretty typical of a Premier League team. City’s lack of leadership and direction with Kompany missing was evident. It was a mix of poor communication and strategy that lead to their dreadful defensive organisation. As I have mentioned, their man-orientations in midfield meant that PSG found it easy to open up spaces. City’s back four were very compact but often left little space between the back four at the expense of allowing PSG lots of space around the side of them, especially due to the fact that Navas and Silva didn’t move back next to their fullback quick enough in defence, and failed to track PSGs runners. The first video in this article is a perfect example of this as it the video below. The video shows City’s compact defensive shape and how they’ve shifted towards the ball. Anyone that watches City regularly knows that they pin an offside line on the 18-yard box line and I criticise it every time I write about them so I won’t again, but the fact that they have an offside trap but no pressure on the ball means that PSG have time to find passes into the penalty area. City defended in a 4-4-2 in the match which is fine when pressing PSG’s possession around the halfway line, but it is pretty crazy to leave both De Bruyne and Aguero well ahead of the ball when defending the final third away in Paris. Fernandinho and Fernando had to press PSGs midfielders in possession, leaving lots of space in between the lines for PSG’s narrow front three to drop in to. City overrun in the centre. Manchester City will be absolutely delighted with the 2-2 scoreline going into the second leg. They were outplayed in most departments however PSG’s failure to create spaces on the last line meant that they didn’t create the chances to match their possession. I expect Manchester City to take more of a studious approach in possession at the Etihad, which would provide PSG with a challenge they aren’t used to encountering in Ligue 1 but also give the French side an opportunity to counter attack.